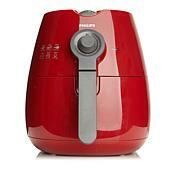 You're already fond of frying food without oil, but you're ready to expand your Philips Airfryer's repertoire. This baking dish has you covered. With the Airfryer's heated, quickly circulating air, you can bake a cake, bread, lasagna, whatever, as easy as you can fry up a batch of French fries. THIS IS A LITTLE JEWEL! GOING TO ORDER 2 MORE!! 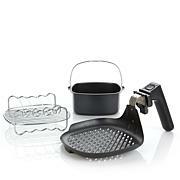 Can do more in my Fryer with this, plus nonstick! 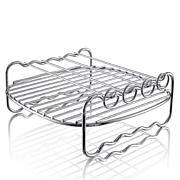 I cooked scalloped potatoes in this pan yesterday in my new Philips Airfryer and only used up half the pan. It looks very small when you open the package. My first impression was a comical, "Oh, wow, I'm going to play dollhouse." But I soon learned that it's plenty big for me, a single person who lives alone.The scalloped potatoes came out great and I look forward to air frying many great meals in this dynamite of a little pan.